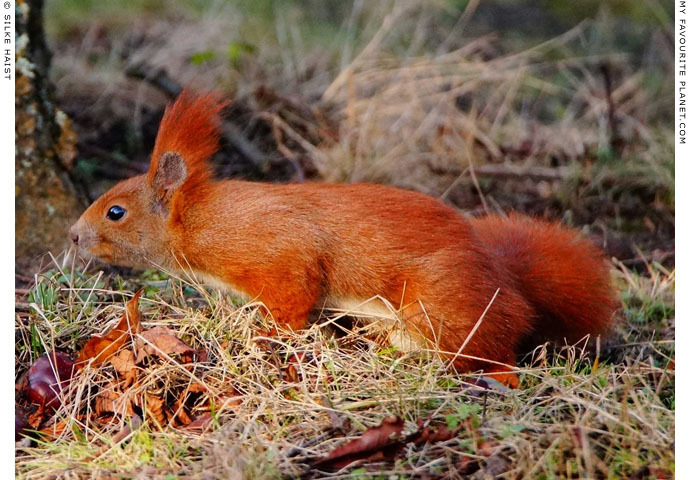 What's red and furry, eats nuts and hangs about in trees? Silke Haist explores the green spaces of Berlin to find out. Silke has been taking photos of wild animals and birds in Berlin for several years, often getting up before the crack of dawn and spending many hours searching for them in the city's gardens, parks, cemeteries and other urban oases. Her patience and tenacity have resulted in a remarkable collection of photographs, some of which she has kindly contributed to this blog. 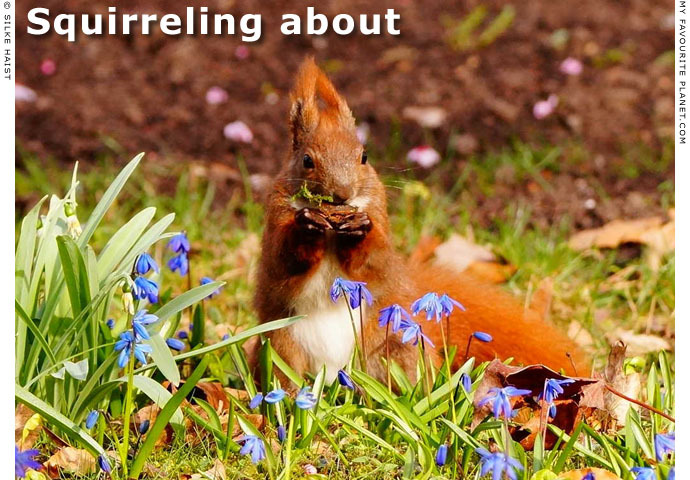 We all have a soft spot for squirrels, don't we? 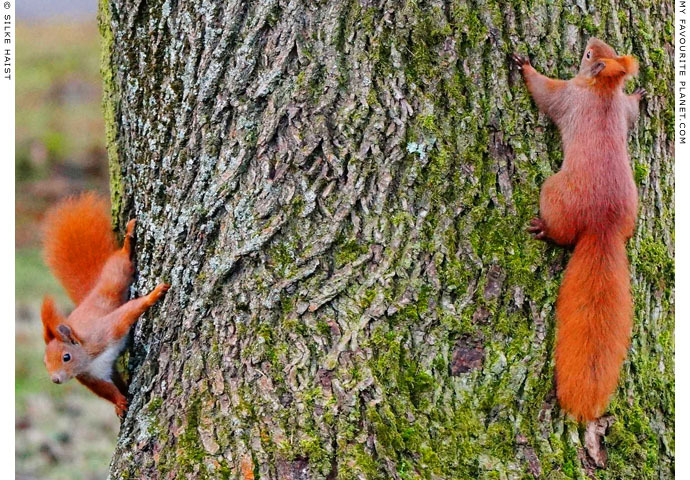 Come on, admit it – even cats have a sneaking admiration for these arboreal acrobats. Admittedly, much of this reluctant respect (understandably not reciprocated) is due to pure envy: if felines were as adept at scurrying up and down trees as the feisty rodents, a lot of firemen and rookie reporters would be out of a job. Most humans find them irresistibly cute, and in many ways the industrious, deceitful, long-fingured opportunists, famous for their curiosity, persistence and setting things aside for a rainy day (in other words hoarding) remind them of themselves. 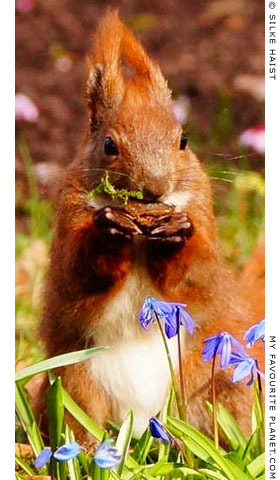 They are very furtive in the ways they "squirrel away" food, and are known to pretend to bury booty at certain spots in order to deceive other animals, creating their own Switzerlands, Liechtensteins and Panamas in peoples' back gardens. Now there's creative accounting for you. None of the squirrels in these photos were bribed with chocolate bars, put on skateboards or forced to wear T-shirts, juggle or perform karaoke. 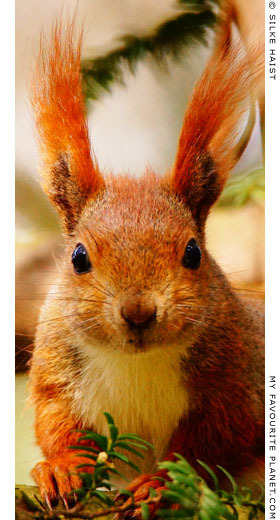 Further down the page there is some blather about urban animals, written by one of our hacks. The editor says he hasn't had time to read it as he was too busy framing one of the photos to put on the desk of his offshore office. 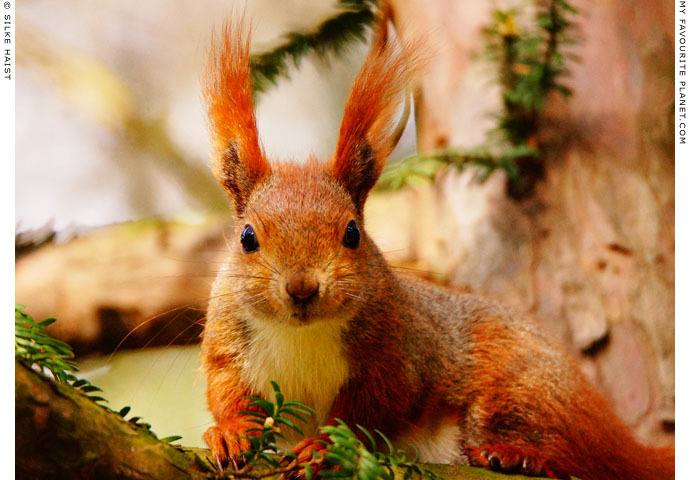 Now where did I leave those acorns? Since the very first Cheshire Cat Blog, we have reported several times on animal life in human environments, particularly in cities such as Istanbul and Berlin. Animals were never planned as a major theme on this blog – which has no particular policy or agenda – but often they just happened to be there when our correspondents were out and about, usually to explore some quite different subject, as in the case of Do Meteora dogs dream of floating sheep?. Animals, wild or domesticated, are conspicuous in urban spaces because we do not expect them and in many places their role in our everyday lives is diminishing. Until quite recently horses were still ridden around cities (they still are in London, and mules and donkeys bear burdens in towns in many poorer countries) or could be seen powering vehicles; cattle, sheep and geese still grazed in and around towns and were herded through the streets (think of India or Pamplona); cats and dogs skulked around and birds of all kinds cooed and twittered in the trees. The very building and expansion of cities deprives wild animals of their habitats, and since many beasts have been seen as competition for resources or threats to health and welfare, those that could not be eaten, employed or exploited in some way have been deliberately or incidentally driven out or killed off. Rats, mice, foxes and moles are obvious examples, but we only have to recall Chairman Mao's encouragement of the mass killing of birds and other animals during China's Great Leap Forward to appreciate the measures taken by humans to get rid of "vermin". Pigeons and doves are now seen as pests (see Spitting feathers), but one reason they are so numerous and ubiquitous is that they were once bred for food and as messengers. Even "man's best friend" the dog, as well as the cat, two of our oldest animal companions, are becoming rare sights on city streets due to health and safety laws. In Germany, for example, feline pets must be sterilized ("kastriert") and are usually imprisoned in apartments. The proliferation of scrawny ferile cats, on the other hand, continues to be encouraged at tourist resorts, where they are considered part of the ambience and vacation experience. The infamous packs of wild dogs in cities like Athens and Istanbul have recently been rounded up and either "put to sleep" or put to work as guard dogs (for example at archaeological sites). Industrialization, the use of chemicals in farming, gardening and other human activities, such as increased waste production and the general pollution of land, air and water have reduced numbers of wild animals drastically and are thought to be causing the demise of songbirds and bees. We have become so afraid that we will forget what a real horse, cow, sheep, pig or chicken looks like that city farms have been created to teach our children that milk, meat, eggs, wool and leather are not simply manufactured in a factory like smartphones or trainers. such as London or New York. From the 19th century urbanization and industrialization increased exponentially, and with growing populations cities expanded into never-ending conurbations. The habitats of wild animals and plants were further reduced by large-scale farming and the trends towards monoculture and intensive livestock breeding. In the late 20th century many politicians and "experts" in Europe considered the demolition of hedgerows – among the last refuges of rural wildlife – to be a jolly good idea. Fortunately, in many places, such as the United Kingdom, it was soon realized that this policy was catastrophic, and even downright lunatic. 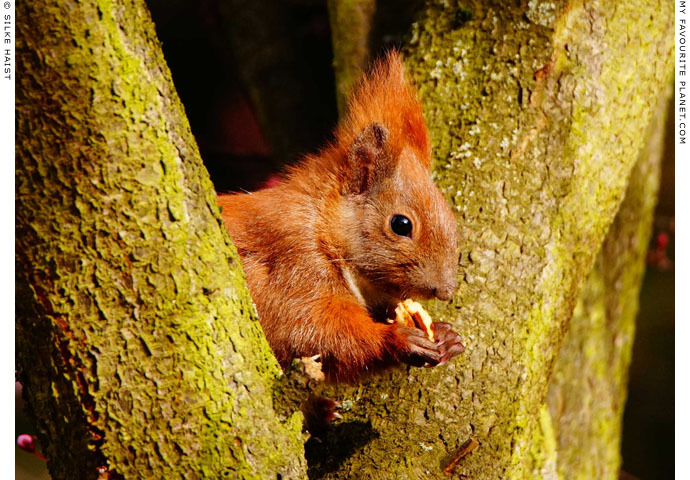 Over recent decades wild animals have begun making a reappearance in our cities: racoons and skunks forage among the trashcans of North America, and foxes colonize gardens and parks in northern Europe, where martens have discovered a taste for automobile cables. In many cases these new inhabitants enter and move around our cities via railways, the very transport routes which first made urban expansion practicable. Essentially, they have nowhere else to go, and in order to survive they have learnt how to benefit from human profligacy, and to a certain extent from our sympathy for cute furry animals. Farmers have a pragmatically hardened attitude to animal welfare, whereas modern city-dwellers want to take fluffy foxes home and curl up with them on their Ikea sofas. (Many countries have laws forbidding the capture of wild animals, but none of this legislation makes any mention of popcorn or who gets possession of the TV remote control.) Either we have been over-sensitized by the naturalism of David Attenborough or softened up by the sentimental anthropomorphism of Walt Disney. What is it with the writers of this blog? Can't you think up their own sub-headlines? Why must you always pilfer from pop songs? You're all fired. Have a nice day, The Editor, P.O. Box 101, Panama City. During a recent visit to Baden Baden in southern Germany, my hosts asked me what I fancied for dinner. I thought Wiener Schnitzel the appropriate reply: when in Rome... They took me to a "traditional" restaurant long famous for this dish, but we discovered that it was no longer on the menu. The waiter explained to us that schnitzel was old hat, and that ostrich steak was now the hot item there. At other places kangaroo is dish of the month, dog tickles the palates of southeast Asians, guinea pig is big in Bolivia, and in France they eat horses, don't they? 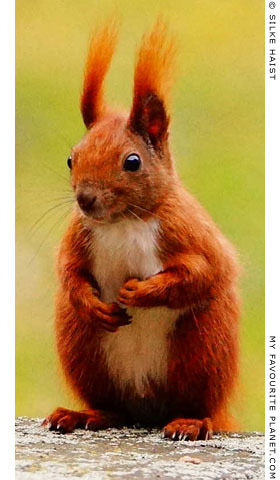 Fortunately, I have not yet seen squirrel friccassé offered as a chef's special, but it's probably only a matter of time. To see a squirrel in chains. Detail of a portrait of Deborah Hall with a chained squirrel as a pet. Painted in 1766 by William Williams (1727–1791). Oil on canvass. Brooklyn Museum, New York. My Favourite Planet would like to hear your comments on this article. You can contact us by e-mail. See the contact page for our e-mail address.